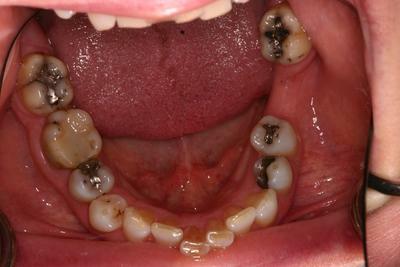 This patient presented with several problems. She had several adult front teeth that did not develop. 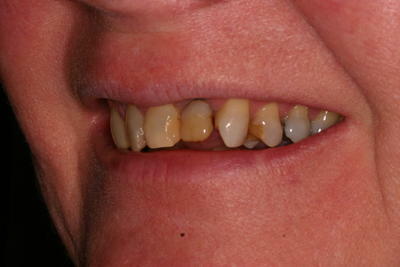 This resulted in her remaining front teeth shifting into the spaces of the missing teeth. The shifting teeth created a situation that left her smile looking less than ideal. For example, the midline of her smile had shifted to one side, and the front teeth had become chipped and cracked, there were also several teeth that had become crooked and stuck out further than what she would have liked. 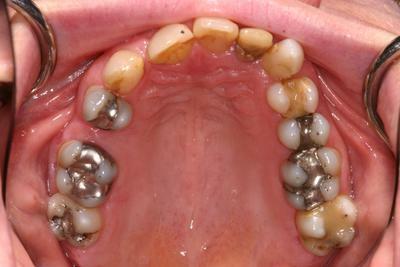 She also had many old broken silver fillings as well as several white fillings in the front teeth that had yellowed considerably over the years. Her teeth had also darkened over the years. She also had some missing back teeth which needed to be replaced to improve her ability to chew and to prevent premature loss of other back teeth due to shifting and overstress. Complicating her situation was the fact that her bite was over closed, meaning the upper teeth came down too far over the lower teeth. This type of bite situation often causes teeth clenching and grinding. 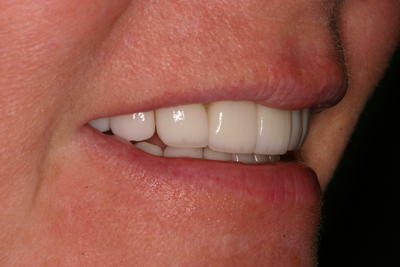 The result of the grinding and clenching is that many of the teeth become broken, cracked and or seriously worn down. Overall she was not happy with the dark color of her teeth and the appearance of her smile. 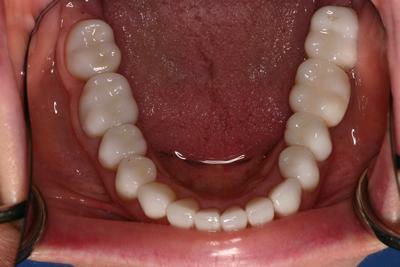 In this particular situation, the patient did not want to wear braces in order to correct the crooked and shifted teeth. I felt that we could greatly improve her smile and bite with a full mouth rehabilitation. 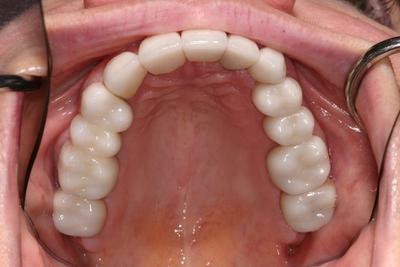 In addition, by employing a technique termed ” instant braces” I felt we could also improve the problem of the shifted midline as well as the crooked teeth. We began by utilizing our Electromyograph to help us return her bite to an ideal situation without causing problems with the jaw joints ( TMJ’s). An electromyograph is a machine that shows us the best position for this patient’s new bite that would bring harmony to the jaw joints, jaw muscles, and teeth. We made a specialized bite appliance to test this new position before we began any restorative treatments. Once we were confident that her new bite position was comfortable and correct, we began the process of restoring and rehabilitating her bite and smile. 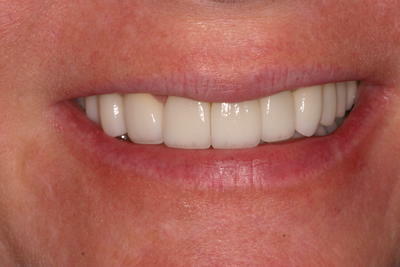 Using a combination of crowns, bridges and veneers were able to complete her treatment. 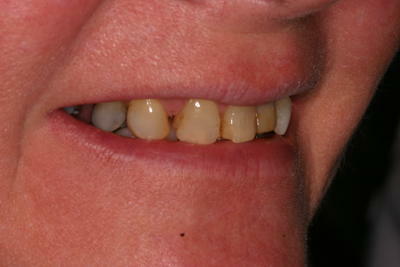 The teeth in front were no longer crooked by using the instant braces technique. We were able to shift the midline back more towards the center of her face, and we replaced the missing back teeth which provided her with a better ability to chew. 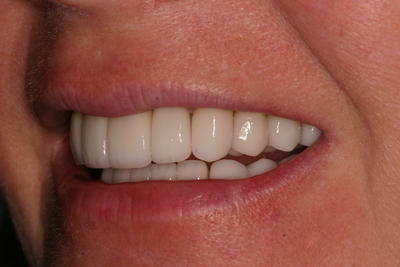 All of this treatment was performed while keeping in mind her desire to have a beautiful white smile. The after photos show a very nice result, inside and out.